Maintaining your motorcycle in line with the maintenance schedule is vital to keep the bike in top condition for safe and enjoyable riding. 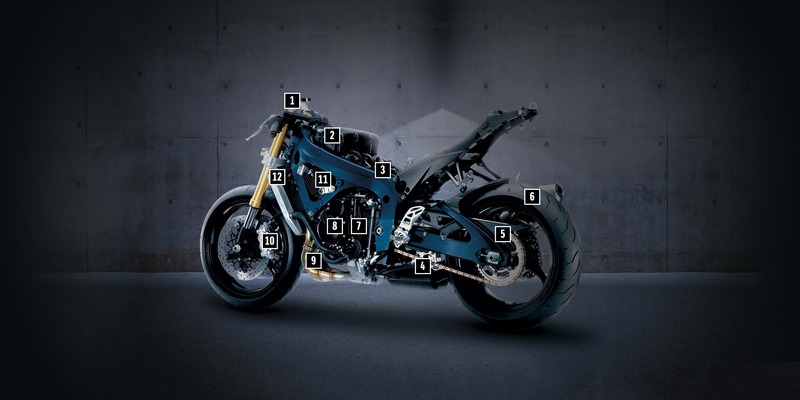 Suzuki genuine parts have the optimal design and specifications tailored for your specific suzuki model, delivering the highest levels of quality and performance. See the numbered parts below to find out why its so important to replace your worn/degraded parts. 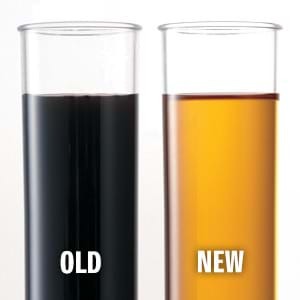 Degraded brake fluid contains moisture and will reach boiling temperature quicker. This will result in reduced brake performance. 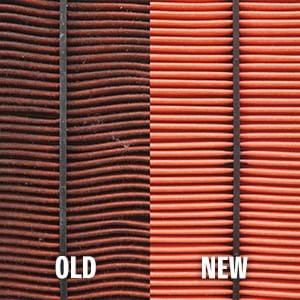 A clogged air filter can reduce air intake, which will result in an increase in fuel consumption and can cause engine wear. 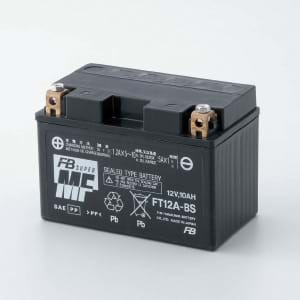 A faulty battery will result in the motorcycle being unable to start or can also cause damage to the electrical systems. 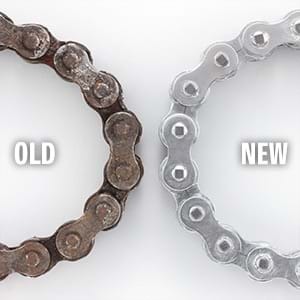 An excessively worn chain may not mesh consistently with the sprocket, this will reduce comfort and performance and can cause damage to the motorcycle. If the chain is badly worn this can be an MOT failure. 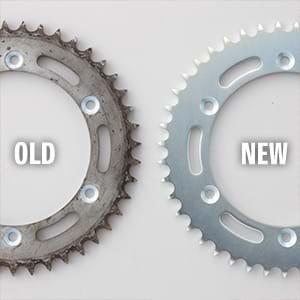 A worn rear sprocket can damage the drive chain, affecting the performance and durability of other parts. If severely worn this will be a serious safety issue as the chain could jump off the sprocket, worn sprockets will lead to an MOT failure. Worn treads reduce the tyre's performance, grip and ability to displace water. Overly worn tyres are also illegal and will result in MOT failure. 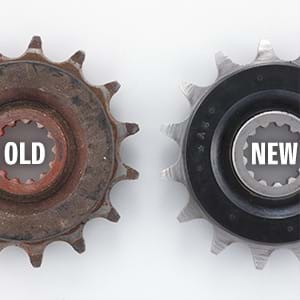 A worn front sprocket can damage the drive chain, affecting the performance and durability of other parts. If severely worn this will be a serious safety issue as the chain could jump off the sprocket, worn sprockets will lead to an MOT failure. 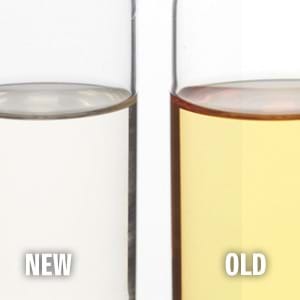 Regular oil changes keeps your engine clean, reduces wear and prevents internal corrosion. 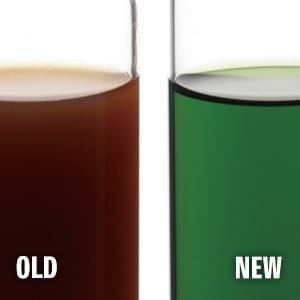 As your oil darkens in colour this is a sign that it is absorbing dirt and carbon thus protecting your engine. 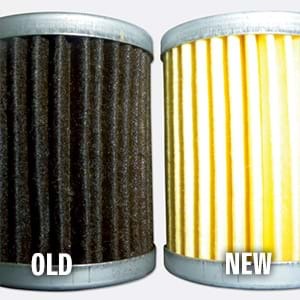 A contaminated oil filter can no longer filter impurities, which may lead to engine damage and increased bearing wear. 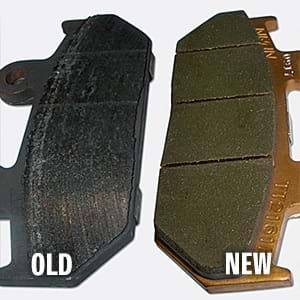 Worn brake pads will affect the motorcycle's brake efficiency and could also cause damage to the brake discs. 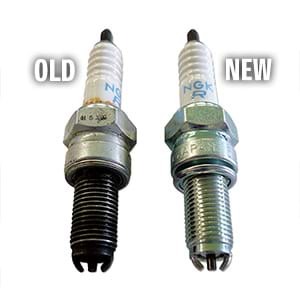 Spark plug deterioration can affect the starting and performance of the engine which can increases the emissions. Over time your coolant loses its ability to protect against corrosion and this can cause engine damage and overheating. 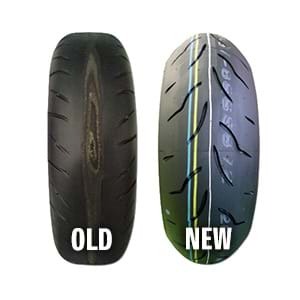 Notes: The photographs are examples of parts deterioration which occurs when riding continuously after exceeding the replacement period indicated in the owner’s manual. The comparative photographs contain parts/oil which are not dedicated to the model shown.